There are two full courts at the New York Liberty’s practice facility in Tarrytown, NY. Katie Smith, the Liberty’s new head coach, stands between them on the sideline, watching her squad go through a 5-on-5-on-5 drill. The Liberty’s roster has been split into two teams and a group of college-level men’s players make up the other five. They go back-and-forth in a fast paced drill, trying to score three points. Get a bucket, stay and sprint to the other side to try and get another. The losers of the drill have to run baseline-to-baseline. A few moments later Smith stands on the court with a big smile on her face and lines up the losers. She blows her whistle and darts out of the way of an incoming sprinter, looking over at her assistant coaches and laughing. Then she kicks everyone off the court and goes through a shell drill, walking the Liberty through one of their offensive sets. Fourth-year forward Rebecca Allenraises her hand and asks Smith to detail the play again. 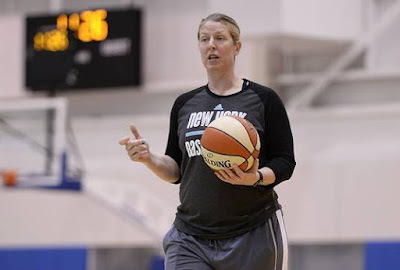 Smith, 43, has already locked up a spot in the Naismith Hall of Fame because of what she did as a player—two-time WNBA champion, 2008 Finals MVP, three-time Olympic Gold Medalist, seven-time All-Star. Now she’s just a few days away from her first season as a head coach. Smith played her last pro season with the Liberty in 2013 and then transitioned right to the bench. It was only a matter of time before she was given the reigns in New York. Smith says that she’s been calling around to her former coaches learn as much as possible in an effort to put Boyd and the rest of her players in the best position to win. She says that Brian Agler and Cheryl Reeve have been key during the offseason to helping her in all aspects of coaching, from writing practice plans to effectively teaching technique. “What’s also been special about the game is not just the playing. It truly is the relationships,” she says, standing underneath one of the baskets at the practice facility. Two of her former teammates, Shavonte Zellous and Marissa Coleman, are to her left. Weatherspoon, dribbling around the gym, has played against her and coached with her for well over 20 years. The recently retired Swin Cash was intensely watching today’s practice. She played on Team USA and two WNBA teams with Smith. Boyd says Smith, with all of her knowledge and years of playing, is already a good coach. “She explains things, she’s breaking stuff down. But she’s also holding us all accountable for our mistakes. It doesn’t matter who you are. If you make a mistake, she’s going to put you on the line and run. I think we’re learning from that,” the fourth-year guard says. But Smith is also known for constantly joking around. Practices are always light, with lots of laughs. Smith and Weatherspoon have spent the last few seasons working with the Liberty’s guards and forwards before games start. Those pregame warmup sessions regularly feature trash talk, smirking and mock games of one-on-one. The Liberty are gearing up for a big season. They’ve been the three seed in the playoffs for the past two years and they’ve been bounced out early in each of those postseason runs. One-time WNBA MVP Tina Charles is still in her prime and Smith has veterans like Zellous, Coleman, Epiphanny Prince, Kia Vaughn and Sugar Rodgers to help Boyd, Bria Hartley, Kiah Stokes and the rest of NY’s young players. That’s why the first-time head coach hasn’t stopped working. Smith, with the weight of the franchise on her shoulders, walks to the far baseline after a moment, right past Weatherspoon, who’s forever dribbling.